2016 GAMES: EDU: If they made games like the educational system, would anybody play? If they made games like the educational system, would anybody play? Why do people voluntarily learn to play games but only learn that stuff in school because they have to? Can anyone harness that intrinsic motivation to learn that games induce? Suppose they made the educational system like games. What is the difference between games and education? Do people learn things when they play games? Why do people play games when nobody makes them do it? If they made education like games, would anybody play? All theater stages are virtual worlds. Just not digital. So they can't come to your house and let you watch them in your pajamas. They can't come to your high school to show your English classes how it is done. If the stage is in New York and you live in River City, you are out of luck. That was before the age of the internet. Now look what the digital stage can do. Note: Information appears from the virtual world operation. Please ignore it. This sim was made to honor Dian Fossey, who single-handedly saved the mountain gorillas from certain extinction. Educators: Would you rather tell about the work of Dian Fosse in this simulation or in a classroom? In a virtual world, I can get a view from almost any angle or distance. That is one of the superpowers of avatars. At Outworldz welcome center, find the Virunga TP panel on the wall. This week at the Short Poetry Workshop we’ll have a time for reflection while we say goodbye to 2016 and ring in 2017. Whether Free verse or form, come share your thoughts about this past year or the new beginnings, resolutions, or new goals for this coming year. Join us at the Short Poetry Library to learn, write and share your New Year poems. Web Graphics Library (WebGL) allows browsers to render 3d graphics, using the computer's GPU. 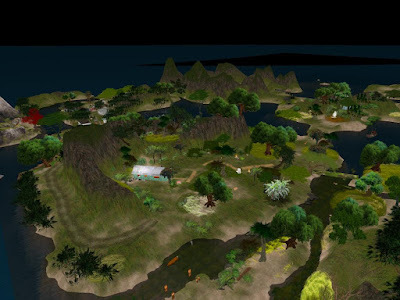 A number of initiatives are working to develop software to access and run virtual worlds in browsers. Some of these worlds are like limited versions of OpenSimulator and the MOSES project is working to develop a WebGL interface to connect the Halcyon Fork of OpenSimulator to the browser. Other OSHG articles in this blog. Cybalounge--Another virtual world on your browser. 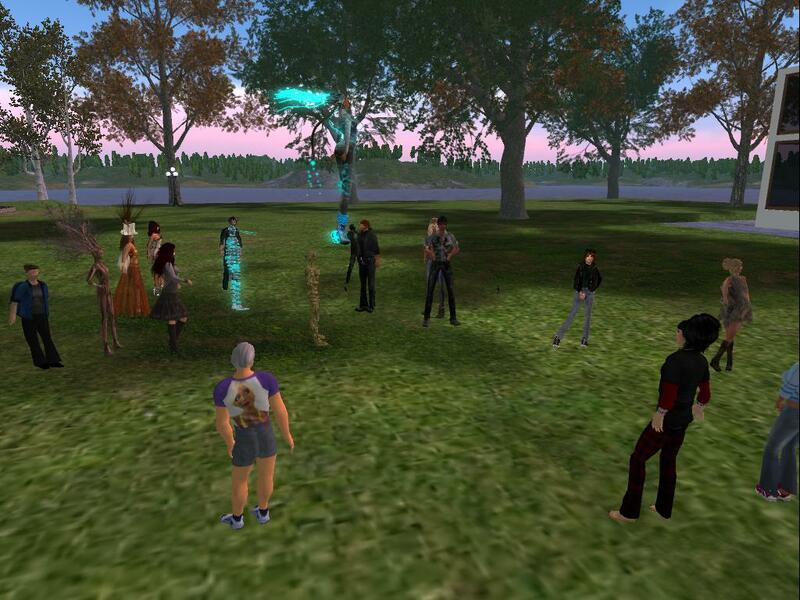 Want to know when people are in your virtual world? Sometimes the owner of a virtual world wants to know when there are people in his world. 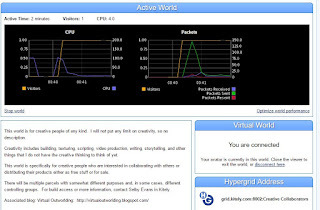 A feature offered by Kitely offers this information in a web page. You just open the world page and the status is right there. Even the count. Maybe you want to go inworld and greet them. It is people to people in virtual worlds. We can welcome people to our worlds. We can invite them to have a seat. We can ask them how we can help them. We may even be able to help them. An we can be a lot more sincere than a web page. We can be even more sincere than Facebook. Who cares if people are in your virtual world? Early demo meeting in Cybalounge. Valibrarian Gregg and a few others attended a presentation by Edward Tarber in Cybalounge, a limited virtual world available in a browser. We had a total of 5 concurrent. Edward streamed a presentation in voice. As a demo, it worked quite well. Edward expects to have an improved version of the virtual world available in January. Presentation was in voice via streaming. It took about 40 seconds to enter as guest (no registration, no password). We listened to the voice presentation and saw slides. We could type questions or comments. With a few improvements, this system would be adequate for presentations. Video showcasing new cross-country ski touring at Novale of CreaNovale Grid (OpenSim), winter We want a region that is appealing to contemplative explorers, photographers, curious minds, and playful discoverers. To this end, we pay a lot of attention to ambient sounds and to building first the big picture on how the many scenes and diverse habitats are integrated in a coherent and organic way and then by adding details and humor. The tour in the video starts at the touring station near the landing in SW corner of Novale. and goes east up to the old greenhouse, turns north toward the farm, goes between the two barns, then on the little wood bridge then to the chapel. The video illustrates the value of making a video by following a tour-scripted object. Another presentation on creativity. That is one the main themes on this blog. To see more articles on creativity, use the search bar, top left on this blog. Creativity is one the main themes on this blog. And one of the main reason people go into virtual worlds. This week the Short Poetry Workshop introduces the Swannet, which is a rhyming sonnet-like form of three stanzas and a couplet that repeats the first and last line of the first stanza. Join us at the Short Poetry Library to learn, write and share your Swannet. ***2016 ART: Virtual (digital) art is art. It is time to reinvent our language and our thinking. Those painted canvas pictures, you hang on the wall--are the real? No, they are really painted canvas. You could call them pigmented art. You don't because art is art and the medium is not relevant. Except when the medium is new. Virtual art has been emerging in many forms and was too new to be called (no modifier) art. That was then. This is now. Leighton Marjoram invites the HG Safari to see how his grid helps counsellors and educators use virtual worlds to explore gender difference and sexuality.